Previous Article Mr. William W. Johnstone are you done turning in your grave? 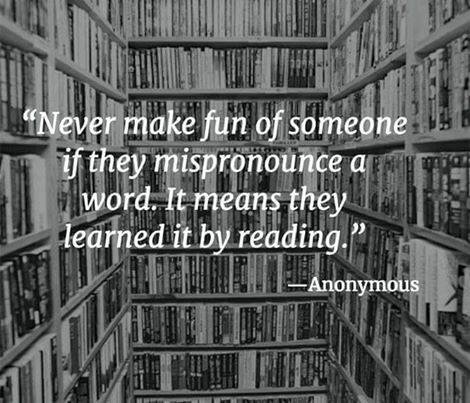 I remember having to read out loud in school when I was a kid. I pronounced a word wrong and the whole class laughed, even the teacher. From then on a had a huge fear of reading or even speaking in front of a group. Love this quot. Very true. I still recall mispronouncing the word ‘superfluous’ in English A level class and my friend (very delicately) correcting me. I’ve done the same thing myself, in college prep English during high school! My son, who began reading when he was three, is famous for this. He has a huge vocabulary but idiosyncratic pronunciation. It is hard not to laugh. That’s great having an early reader!